Wheelchair users opens door from his phone. 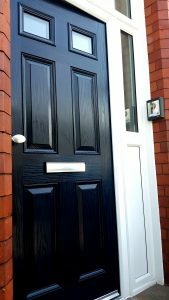 Entrance door manufacturers Vista Panels Ltd recently teamed up with lock experts Winkhaus to help a wheelchair user open his door from anywhere in his property via his smart phone. Paul Allen had previously found it difficult to let in visitors without having to manoeuvre his wheelchair to the intercom system in his hallway. Paul wanted to use some of todays smart technology to find an alternative solution. Told about Paul’s predicament Vista were able to incorporate the electrically operated Winkhaus AV2e lock with their highly secure, durable and low maintenance GRP composite door the XtremeDoor. The multi point ‘Secure-By-Design’ lock when connected to the mains and an intercom system allows the user to let in visitors without having to get to the front door. The door will then lock itself automatically when it closes. Even better, Paul utilised some software from the intercom set up to work with a webcam and smart phone. That means he can see who’s at the door and let them in from wherever he’s sat in the house – including important callers like Meals on Wheels and care providers. “I’m delighted with my new door,” said Paul. “It’s made life so much easier, and made me feel a lot more secure, too – now I can always see who’s at the door before deciding whether to let them in or not. Winkhaus and Vista did an amazing job, and I’m really grateful to them, this technology has really given me some independence back, it was also far more cost effective than existing access solutions I had seen on the internet marketed at the disabled community. Vista Panels Marketing Manager Ian Smith commented: “It was really rewarding to see how our door set could be used with the Winkhaus AV2e lock and this software for disabled people who need an automated entrance solution”. This article was posted in Company News by Vista.